How to book a ThirtyFifty wine tasting. When you contact us we'll take your details and respond to your brief with a written proposal. Normally this will include at least two price options for the wines. If you have already set a date we'll need to check availability, otherwise we can find a mutual date or provide a choice of dates. Wednesdays and Thursdays are the busiest evenings for corporate events and need to be booked further ahead. We'll need to know how many guests you intend to invite and how many you think will attend! We can help with aspects of marketing the event to achieve a good attendance. We ask that you confirm numbers 10 days prior to the event. We can run the tasting at your offices or at any alternative venue that is happy to accommodate us - here are some venues we have used or can recommend. We can help to find a auitable venue or we can come to a venue that you have already organised. We suggest canapés, nibbles or cheese & biscuits are provided plus water/light refreshments. This can be easy to arrange yourselves or we can help by recommending a caterer. We will happily liaise with your caterers on food & wine matching. 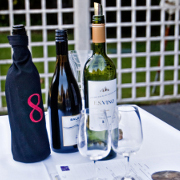 We provide professional wine tasting glasses, spittoons and tasting notes. A qualified ThirtyFifty Wine Consultant will run the tasting. Additional staff may be required depending on number of guests, your requirements and format of wine tasting. Most wine tastings take 2-3 hours but can be shorter or longer as required. To confirm a booking ThirtyFifty require a non-refundable deposit of £100 or 25% of the total fee including VAT, whichever is greatest, based on the estimated number of guests at the time of booking. This deposit is required within 10 working days of a provisional booking being made. If the number of guests increases or decreases the client shall inform ThirtyFifty of the changes and confirm final numbers no later than 10 working days before the event. At this time (10 working days before the event) the full, outstanding payment will become due. Should the number of guests attending the event increase ThirtyFifty will invoice the client for the additional guests after the event. If the booking is cancelled more than 10 working days before the date of the wine tasting ThirtyFifty will retain the deposit. This deposit can be used against a future tasting if re-booked within 6 months. If the booking is cancelled within 10 working days of the wine tasting, the deposit will be retained and the outstanding balance will be required as a cancellation fee.